But, when or how does this transformation happen exactly? We might probably say that it starts when students fill out their UWC application, then when they arrive on their campuses and start to settle in. The big milestones such as CAS (Creativity, Action, Service) Week and Project Week play a big part in this, but the “in-between” moments are sometimes much more powerful. The connection our students form with each other, learning about new cultures and ways of thinking, those moments — our students and alum alike — describe as the most powerful and transformative. 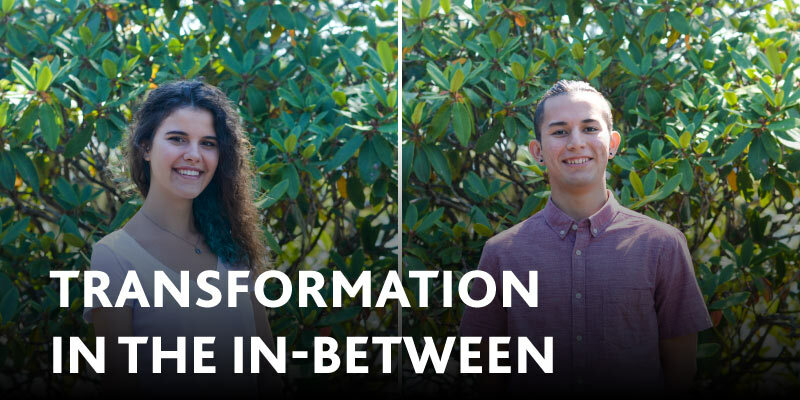 We recently spoke with two of our second-year students, Danny Gerdzhikova (YR44/2019, Bulgaria) and Juan Daniel Arias Mesén (YR44/2019, Costa Rica) about their summer “in-between” (the gap between first year and second year) and transformation is written all over their story. “When my second year Beiyi first told me about the Illumino summer camp, I could not stop thinking about how much I wanted to be a part of it and what scenarios I would create for participants,” Danny explains. While the first camp in 2017 focused more on creative arts and exploring different values and cultures through this medium, the 2018 edition was centered around the topics of cultural diversity, environmental justice and social exclusion. The change the participants underwent in the short time struck a chord in both Juan Daniel and Danny. In one of her workshops, Danny led the students through a simulation of social exclusion. The participants were randomly assigned a role or character. After they took a moment to imagine the daily lives of their characters, all participants started in a straight line standing next to each other. In each scenario they were allowed to take steps forward if a statement about their characters’ daily lives was true. For example, the character of a 19-year-old gay Muslim woman living in India initially took much fewer steps forward than the son of an influential mayor in Slovenia. Students experienced their characters’ opportunities and challenges in day-to-day scenarios, reflecting on morality, status, advantages, disadvantages and equality. “I intentionally made the characters very controversial,” Danny smiles. “I would ask them: It is morning and you wake up. Do you have a bed to sleep on? Take a good look around and tell me what you see. Is there someone who wakes you up? Can you afford to go eat at a restaurant? You go to school and you get your grades back. What do your grades look like? Do you have friends at school? “I was blown away to witness how our participants came to life. They reached deep inside themselves and we shared big revelations. It was very rewarding,” Danny reminisces. Both Danny and Juan Daniel had to put all their UWC skills to practice, often with little or no time to think about how to achieve a certain outcome. They had to solve problems fast when a participant felt homesick and asked if they could leave or when Danny had to create an impromptu morning energizer to get everyone motivated and ready to take on the day. Danny remembers participants coming to her afterwards telling her that the exercise had been lots of fun. She laughs and admits that she did not know how she did it. “There was a lot of improvisation, and it worked. I realized that we can create an impact with the seed of a small idea. Something in the participants lives changed. And something certainly changed in mine,” Danny adds. When first-year students leave campus over the summer, the transformation they undergo is evident when they return as second-years. Their experience in their initial UWC year prepares them for taking on leadership roles and they welcome first-year students with open arms even though they miss their second-years immensely. Everything about how they had experienced the campus before changes over the summer, but they come back with a new “aura” about themselves. They have matured, are ready to take on the IB exams, and the world.